As we were driving along taking photographs for our day job of the freshly cut bales of hay across western South Dakota, we caught something out of the corner of our eye on a fence post. Meadowlark? No, it was way to big and had too much space underneath between the fence post. 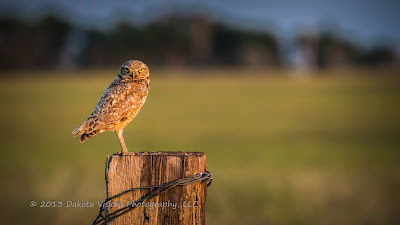 So we stopped, tracked back, and sure enough - a burrowing owl (Athene cunicularia) sitting on a fence post looking for its evening meal. We couldn't help but take a few photographs before letting the beautiful bird have supper in peace.